Today I’ll be taking a look at the iPad mini. It’s Apple’s new small-form, portable tablet, And it’s looking to find its place in the 7 inch tablet market. The large 9.7 inch display iPad is a popular tablet. It’s unibody aluminium chassis means that it’s sturdy and feels good in the hand, But at 652g, it’s no feather weight. Enter the iPad mini. It’s 60 percent the size, 23 percent thinner, and 53 percent lighter. It’s the iPad you really can carry around in one hand. But it’s not alone in the market. Meet the Nexus 7 and the Kindle Fire HD. Two 7 inchers that are giving the little iPad a run for it’s money. So let’s find out a bit more about the iPad mini, And how it compares to these other tablets. If you’re used to iOS devices, Then you’ll be right at home with the iPad mini’s design. It has the same unibody aluminium chassis as the larger iPad. With a new ‘lightning’ port, and dual speakers on either side of it. Meaning that the mini has stereo speakers. Everything else is pretty much in the same place. There’s the round home button where it always is, below the display. The volume buttons and silence or orientation lock are on the right. The power button, microphone, and 3.5mm headphone jack are all on the top. However, the mini’s side buttons are metal, And I find this gives them a more hardy feel. Sort of like it’s saying… “I may be small, but I’m tougher than I look!” It has some usability tweaks up its sleeves too. Because when you first see the mini’s really narrow side bezels, You may think it’d affect how you hold it in portrait mode. But the software’s been adjusted, So when you rest your thumb on the side, It doesn’t register as an accidental tap. The iPhone 5 behaves the same way. So what about the other 7 inch tablets? Well for a start, they’re both about £100 or $130 cheaper than the mini. Now, if price is the only thing that concerns you, Then you probably don’t want to hear anything else, But I like comparing things, So I’m going to continue. You’d think that with its 7.9 inch display the mini would be wider than the other tablets. And yes, It is wider than the Nexus 7 by nearly one and a half centimetres. But it’s about three to four millimetres narrower than the Kindle Fire HD. Lengthwise, the mini is longer by two to seven millimetres. But there’s a bigger difference in thickness and weight. The iPad mini at 7.2mm is much slimmer than the others, And also lighter, at 308 grams. Translating all that into practical use… The mini is very comfortable to hold in one hand. It’s thin and light, And the curved aluminium chassis sits well in the hand. The Nexus 7 is next. It feels smaller, because it’s narrower. And it’s weight in the hand is comparable to the mini’s. Its plastic chassis also has a soft-touch texture, which makes it comfortable to hold. The Kindle Fire HD, though, feels much heavier than the other tablets. It’s plastic back is soft touch, but doesn’t have a grip-friendly texture like the Nexus 7’s, So it’s not as comfortable for long term holding as the other two tablets. As for storage… The mini is available in 16, 32, and 64GB models. The other two tablets come in 16 and 32GB versions. None of them have a microSD card slot, So with each one you’ll be heavily dependent on either Apple’s, Google’s, or Amazon’s cloud services. What the iPad mini lacks is a retina display. On it’s own you won’t notice much loss of sharpness on the mini, But put it next to the larger iPad and you’ll see the difference. Take a look at the bbc website. This is the desktop version open on both iPads. Small text is much more readable on the 9.7 inch iPad. You can see that difference better on a page with lots of text. Now some magazines. And this will give you an idea of how images look on both iPads. Images and text are sharper and clearer on the larger iPad. It also has better contrast. Compared to the Kindle Fire HD and the Nexus 7, I find that the iPad mini’s wider display is better for web browsing. The mini has a lower resolution, and fonts display slightly larger than on the other two tablets, Actually making reading much more easier. Even at maximum zoom, Text on the iPad mini isn’t too blurred, And is quite similar to the other two tablets. There’s more pixelation on the mini’s zoomed in images though. I do a lot of reading, So I wanted to see how the iPad mini does against a dedicated e-reader like the Kindle Paperwhite. Here they are in very bright sunlight, And with display brightness at maximum. There’s much more glare on the mini’s LCD display, While the paperwhite’s display has better contrast and remains easy to read. Back indoors, The paperwhite’s display is still easier to read from at maximum brightness. But of course the iPad mini does have a huge advantage over the paperwhite. It’s a tablet and it can show images, book covers, and such in colour. Maybe not so important if you read a lot of novels, But very useful for textbooks, comics, and PDFs. Reading in the dark at maximum brightness is not comfortable on an LCD display like the iPad mini’s. There’s just way too much light glare, And all the text is washed out. You get the same problem even at minimum brightness. The Kindle paperwhite’s display looks quite dim here on camera, But in reality it’s quite readable, And you don’t get the sort of eye strain you’d get with an LCD display. But how does the iPad mini do against the other tablets? In really bright sunlight, The Kindle Fire HD’s display has the least glare. The Nexus 7 follows, And the mini has more screen glare than both of them. And you get this effect no matter which angle you look at it from. An interesting note though, The Kindle Fire HD doesn’t actually show white as white. Compared to the paperwhite, a white background on the Fire HD looks more yellow. You see the same colour difference when it’s compared to the Nexus 7’s display, which tends to be more on the blue side. When we look at the three tablets indoors, At normal reading distance they’re equally readable. The iPad mini’s lower resolution doesn’t hinder it here. Next I have my display test video to show how the mini handles colour. Comparing it to the larger iPad first, The deep pink of this flower is much more orange on the mini. The larger iPad has better contrast. This purple flower is more washed out on the mini, And the red rose has lost saturation and looks orange. It gets difficult to spot big differences with darker images like this snail shell, And these pink petals on the water. Comparing the three seven inch tablets, The mini shows finer detail, like in the middle of this flower. 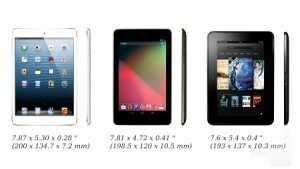 The Kindle Fire HD follows, And the Nexus 7 shows the least detail of the three. With this field of flowers, The iPad mini comes closer to true colour and is brighter. The Nexus 7 loses some vibrancy here, Mainly because of its blue cast. I prefer the saturation of the Nexus 7 with these runner bean flowers. The others are showing more orange, With the Kindle Fire HD being the most yellow-orange. The iPad mini shows the most detail on the wheat. Again the Fire HD is putting in too much yellow, And the Nexus 7 loses vibrancy and detail. You can see the difference in aspect ratios with this 1080p widescreen video. There’s no letter-boxing on the Nexus 7, While the iPad mini has thick borders above and below. It’s interesting with these flowers that none of the displays are getting the blues spot on. The iPad mini shows better colours on the butterfly, While again the nexus 7 loses vibrancy with too much blue, And the Fire HD is again too yellow. You see it very clearly here, with white clouds being slightly yellower on the Fire HD, And tending towards blue on the Nexus 7. The iPad mini’s internals are actually based on the 2011 iPad 2, Not quite the level of the quad-core Nexus 7. While the Kindle Fire HD also has a dual-core CPU. But really there’s no huge difference in day to day performance. Just like the Nexus 7 and the Kindle Fire HD, The mini handles everything smoothly. From playing games to watching 1080p movies, There’s no lag or stutter. User interface is very simple on the iPad mini. You have the homescreen, and that’s it. All your apps are arranged in an orderly grid, And you can place them in folders or on the dock. Compared to the larger iPad, The mini, for me, really stands out for reading ebooks. Sure the display isn’t as sharp. But at normal reading distance, text looks fine. It’s just much lighter and more comfortable to hold in one hand. You also get all the major bookstores on here, Including Apple’s iBooks, Amazon Kindle books, Google Play books, and the Nook and Kobo stores. Magazines, though, are a different experience. Here I prefer the better resolution and bigger display of the large iPad. It shows of images to the best effect. And really, I can say the same for photos. The Kindle Fire HD’s interface adds a few more features compared to the iPad mini’s simple one. It’s based on Android, but Amazon have limited it’s customisability immensely. But I feel it’s layout is easier for the first time user compared to a typical Android tablet. It has a carousel layout rather than a grid. The homescreen shows a carousel of your recently opened items. There’s a category list running across the top, And you can access the Kindle store from here also. The most customizable interface belongs to the Nexus 7. There are apps and widgets and customizable grids. A new feature with the latest Android 4.2 is multiuser homescreens. This lets people share the same tablet, Giving each person an individual user interface. But only the admin user can uninstall apps. And that brings me to the app stores. The iPad mini has access to the well-stocked iOS app store, Which has a varied and quality app selection. You can also load all the iPad specific apps on the mini. With the Nexus 7 you get the Google Play store. Now while the number of apps is growing here, It doesn’t have the variety offered by the iOS store. Also, there isn’t a huge range of tablet specific apps. The Amazon Kindle app store is the most disappointing of the three. Choice is comparatively limited when it comes to games and productivity apps. But the Kindle store does have the best ebook collection. Now a common question with the iPad mini and other iOS devices… “Don’t I need iTunes for everything?” Well…yes…and no. You see, everything you buy from the iOS app store, including music and movies, are all installed and updated over wi-fi. And just like with Amazon cloud services and Google’s play store, Your purchases are stored in Apple’s iCloud in your own account. You can also use iCloud to back up your iPad, store your documents, photos and other stuff. So what about iTunes? Well, that’s what you use to load your own music, videos, photos, and documents to the iPad. You’ll also need it for local backup if you don’t want to use iCloud. It’s pretty straightforward for Mac and PC users. But on Linux you’ll need to use the libimobiledevice project. It comes included in the latest Ubuntu, Otherwise just download it from the web and install. Now I just want to run through the connectivity options on all three tablets. All of them have wi-fi and bluetooth. The iPad mini and Kindle Fire HD have dual-band wifi for better reception. The Kindle Fire HD actually has a dual antenna set-up as well. It doesn’t have any mobile data option, however. The Nexus 7 has a 32GB version that goes up to HSPA+ While the iPad mini has 4G LTE models. Both the Nexus 7 and iPad mini have GPS support, But only the Nexus 7 has NFC support, Which, though not widely used at the moment, might be important to some. When it comes to loudspeaker performance The Kindle Fire HD is boasting some pretty impressive specs With Dolby audio, dual-driver stereo speakers. The iPad mini has also gone for stereo speakers, With two speakers on either side of the lightning port. Same with the Nexus 7’s stereo speakers, Which sit at the bottom of the tablet. The Kindle’s speakers, however, are placed further apart, On either side of the display. This gives a wider sound field, deeper bass, better sound overall. So let’s hear each tablet in action… My preference for sound quality is The Kindle Fire HD first, Then the iPad mini, Followed by the Nexus 7. The iPad mini has the same rear iSight camera as the larger iPad as well as a front facing camera. I personally haven’t had much use for rear camera’s on tablets, But that being said, The iPad mini is comfortable enough to hold up and take quick shots with. The Nexus 7 and Kindle Fire HD only have front-facing cameras for video chat. The iPad mini’s battery life has been very good. It definitely keeps up with the larger iPad. From the way I use tablets, I can easily go a couple of days without needing to top up the charge. Tech specs for both iPads actually claim up to 10 hours of continuous use. The Nexus 7’s tech specs claim up to 8 hours of continuous use, And for the Kindle Fire HD it’s 11 hours. For a quick comparison, I have here some percentage battery usage figures for all three tablets… As you can see, With games, the iPad mini did best whether the game was graphic intensive or not. And the Kindle Fire HD did better than the Nexus 7. For web browsing, again the iPad mini did better. And for watching HD movies or reading ebooks, both the mini and the Kindle performed equally well. The iPad mini is light and portable enough that I can see it replacing my larger iPad for many things, Especially reading ebooks. If it had a retina display, It might have replaced my large iPad completely. But even as it is now, It’s still a great multimedia device, Especially if you’re heavily into apps. It also has the plus points of having a rear camera and a 4G LTE version. Both the Nexus 7 and Kindle Fire HD are cheaper, But I feel they appeal to different types of consumers. While the Nexus 7 is good for multimedia, It’s customisable interface, quick multitasking and notifications mean that it will appeal more to people looking to get productive with their tablet rather than focusing on apps. The Kindle Fire HD on the other hand, Is a great deal if you’re already heavily invested in Amazon’s ecosystem and you’re an Amazon prime member. But other choice is poor on it at the moment.